Dolphins are sometimes thought of as the dogs of the sea because they are usually playful and friendly. They’re also among the smartest animals on Earth. Dolphins are water mammals. Scientists believe they’re as smart as chimpanzees or dogs. They live in rivers and oceans, but they must come up to breathe air. Dolphins live in rivers and oceans, but the fun thing all about dolphins is that they must come up to breathe air. 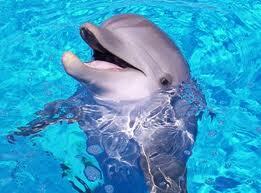 A Dolphin is a cetacean mammal, related to whales and porpoises. Though people sometimes think ‘dolphin’ and ‘porpoise’ are the same thing, porpoises are not considered dolphins and have different physical features (Porpoises have a shorter beak and spade-shaped teeth) and they also behave in different way than a dolphin does. Porpoises and dolphins share a common ancestry, being of the Delphinidae mammal family. Bottlenose dolphins live in rivers and coastal areas in the southern United States. They are usually gray. Most dolphins are black or gray. Killer whales (a type of dolphin) are black and white. Bottlenose dolphins are the most common type of dolphin. You’re likely to see the Bottlenose dolphin in rivers and coastal areas in the southern United States. They are usually gray in color. Scientists say that there are 45 different species of dolphins, five of which are river dolphins. Bottlenose dolphins live up to 40 years while the Orca (killer whales) can live up to 80 years. Dolphins sometimes die when they become trapped in fishermen’s nets. Dolphins live in groups called schools or pods. 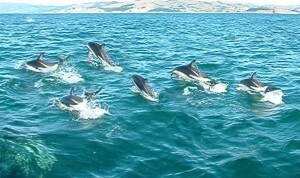 A female dolphin leads the herd. Male dolphins are called “bulls”, females are called “cows” and the young dolphins are called “calves”. Calves stay alongside their mothers up to 3 years and sometimes up to 8 years. Dolphins use squeaks and whistles to call to each other. Like bats, dolphins use echolocation to find food and objects. Dolphins eat fish and squid. A group of dolphins is called a school, or Pod. Dolphins are very social, a family (pod) can have 1000 members. The smallest dolphin is called a Maui’s dolphin. It is only 1.2 m (4 ft) long and 40 kg (90 lb) light. Like a small human child! They are the rarest type of dolphin and live off the coast of New Zealand. The Orca, also known as the killer whale, is a type of dolphin. It is a huge type of dolphin, as long as 9.5 m (30 ft) and weighing around 10 tonnes! Orcas belong to the mammal family of Delphinidae so they qualify as dolphins. Dolphins like in groups called herds or pods. A female dolphin leads the herd. Dolphins are sometimes thought of as the dogs of the sea because they are usually playful. But always remember they are wild animals, never feed or touch them. A video of a dolphin show to see how smart dolphins can be when trained. 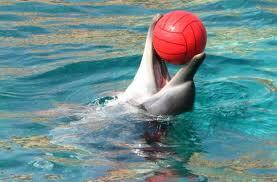 Many people think it is cruel to keep a dolphin in captivity, especially as they are such intelligent creatures. It is cruel to keep any animal in captivity (like in a cage in the zoo), yet sometimes it is the only way to show kids rare or endangered animals, or animals from far away places. Animals are usually very sad to be in captivity and are best left in the wild where they belong. Imagine, would you be happy if you were in a little room for all your life till you died? How would you feel, if you could never run, climb, go on a trip, take long walks or play your favorite sports game? Would you like it if you were taken away from your family and friends and were lonely without ever meeting new people, just walking back and forth in your room all your life? It is fun to watch a show, just remember, it is not always fun for the animal to be part of it! Answer: Dolphins are usually gentle and friendly. They have even been known to help injured swimmers and sometimes even to save people from sharks. They are highly intelligent creatures and can be trained to do complex things. Some think a dolphin can help depressed people. However, they are wild animals and should be treated kindly and carefully. If you annoy a dolphin, he could poke you with his nose real hard. That is why sharks fear them. Answer: Killer whales and bottlenose dolphins aren’t endangered, but many river dolphins are. Dolphins often get killed in fishermen’s nets, especially Tuna fishing boats cause many to die. Dolphins have very sensitive ears so they suffer very much from loud noise, like from motor boats, jet skis etc. Enjoyed the Easy Science for Kids Website all about Dolphins info? Take the FREE & fun all about Dolphins quiz and download FREE all about Dolphins worksheet for kids. For lengthy info click here. Declan, Tobin. " Fun Dolphin Facts for Kids ." Easy Science for Kids, Apr 2019. Web. 21 Apr 2019. < https://easyscienceforkids.com/all-about-dolphins/ >.